After watching Ant-Man, I revisited Marvel’s planned film releases for Phase Three and thought that it would be a shame not to have an Ant-Man sequel. It looked like there wasn’t much room for additional films, especially since they were already set to release two films per year up until the end of Phase Three. Which, if you look at what’s happened in recent years, is exactly what they’ve been doing. I was all set to write an entire article covering what I thought were missed opportunities, films that could be made but I thought had no chance until after Phase Three. One of them was an Ant-Man sequel. I’m glad I didn’t because Marvel just announced that they will be making a sequel to Ant-Man after all. Fan art for Ant-Man and The Wasp. Not only that, Marvel also announced release dates for three yet to be named films, all of which slated to come out after the Phase Three films. So now I can take a totally different tone because Marvel Studios just showed us that they’re willing to change their plans. With that said, I’d like to share my thoughts on films that I think would make for really good additions to the Marvel Cinematic Universe. Before I get to those, I’d like to establish my ground rules, some restrictions that I imposed on myself. First is that I limited myself to characters that already exist in the MCU. Marvel has hundreds of characters that can have films centered around them given the right creative direction so if I didn’t limit myself, I would end up with a really long list. With this restriction, I’m also recommending films that fit organically in Marvel’s current film slate. We already have three characters new to the MCU that will be introduced in the coming years, so adding more might be too much. Oh and one last thing – I’ll be talking about some minor spoilers for Guardians of the Galaxy and Avengers: Age of Ultron so if you haven’t seen those movies yet and don’t want to be spoiled, you should stop reading this article and start finding yourselves copies of those films. Seriously, its been a long time since those films have been released, you should go see them. I understand that I’m already breaking one of my rules by talking about a character who has yet to be introduced in the MCU, but let me explain first. Yes, Nova isn’t someone we already know, but we already know about his universe. We know about Xandar and we know that the Nova Corps exist. I talked about choosing characters that would fit organically with where the MCU is at this point in time, so let’s consider the state of the Nova Corps by the end of Guardians of the Galaxy. The Nova Corps suffered massive losses in the battle against Ronan the Accuser. The Corps were essentially decimated, with a big part of their fleet getting destroyed and maybe hundreds of their soldiers losing their lives trying to defend Xandar from Ronan’s assault. With that in mind, wouldn’t the logical step be to find new recruits and replenish their ranks? That’s where Nova (his comic book name) comes in. We’ve seen a superhero in training already with Ant-Man and we’ll see a young rookie hero in Spider-Man, but neither of them are in the position of joining an established peace-keeping force the way a new recruit like Nova is. To further differentiate Nova from other MCU heroes, Marvel can pair Nova up with Rhomann Dey, John C. Reilly’s character in Guardians of the Galaxy. A veteran Nova Corps member forced back into the field, Rhomann Dey’s task is to be partner and mentor to Nova. Together, they can form a buddy cop dynamic that has yet to be seen in the MCU. Going beyond this, a Nova Corps film can plant the seeds for Marvel’s next big event after the Infinity War. The Annihilation storyline stands out to me, but I’m not sure how feasible that is given that Fox owns the rights to several key players of that event through the Fantastic Four deal. Brendan Fehr’s brief cameo in Guardians of the Galaxy. With two failed attempts at making Hulk a successful movie franchise, I don’t blame Marvel for not coming up with a sequel to The Incredible Hulk. But Mark Ruffalo’s portrayal of both Bruce Banner and the Hulk in the two Avengers films were positively received. And Marvel has better creative control over their films, so isn’t this a good time to revisit the Hulk’s box office viability? I think it’s time for Ruffalo to be rewarded with his own MCU movie. Here’s the thing – the Hulk is a better known property than Ant-Man or Guardians of the Galaxy, so holding out on another movie just because the two previous attempts weren’t successes is missing out on a property that could be as popular as Thor. And if you think about it, The Incredible Hulk wasn’t an outright failure, it just underperformed. It wasn’t another Elektra, Fant4stic or even Daredevil. From a creative standpoint, it’s a good time to revisit the Hulk’s character. Near the end of Avengers: Age of Ultron, the Hulk essentially exiles himself from his peers by disappearing without a trace, cutting them off because of what happened when the Scarlet Witch messed with his mind. Bruce Banner has always had problems with his Hulk alter-ego, but now he can’t even be around his own kind. Wouldn’t it be interesting to know where he went and what he plans to do with himself? A comic-book storyline that people have been mentioning when talking about potential Hulk films is Planet Hulk and World War Hulk, but I think there’s a classic Hulk tale that’s a perfect follow up to what happened to him at the end of the Avengers sequel: Future Imperfect. 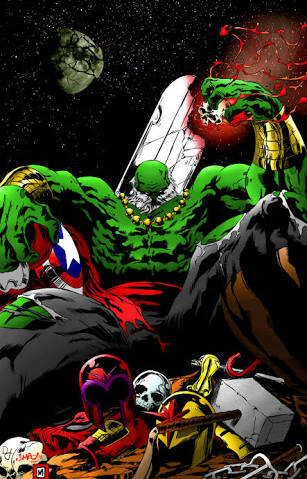 In the original storyline, a Hulk-like being known as the Maestro has become the Earth’s ruler and dictator in an alternate future timeline. To stop him, rebellion forces opposing the Maestro go back into the present to recruit the Hulk to help them in their cause. The Maestro – the main antagonist of the Future Imperfect comic book miniseries. Look familiar? You know what? There’s no way for me to talk about this effectively while skirting around the issue of spoilers, so I’ll just say it – the Maestro is a possible future incarnation of the Hulk, driven insane by the radiation resulting from nuclear war. He’s got the intelligence of Bruce Banner and is even more stronger physically because of all that radiation. In the Future Imperfect storyline, the Hulk has to face his future self. This storyline could be tweaked to fit Banner’s current MCU state. What would happen if Banner leaves his Hulk persona unchecked? They can revise the reason for the Maestro’s insanity into something that fits the MCU, such as Banner’s decision to isolate himself from the rest of mankind. Doesn’t it make sense? Not being around humans can make the Hulk lose whatever humanity he has left, which can result in him turning into the Maestro. This encounter can be the means for Banner to realize that he needs to take a different path if he doesn’t want to become this possible future version of himself, effectively bringing him back into the fold. How does Bruce Banner get to the future? Well, Scarlet With has already shown that she has the ability to show people visions of either their past or possible future, so the entire thing could all be just her doing. Or better yet, the Time Gem could be involved – we have yet to see that particular Infinity Stone in the MCU. I may already be reaching, so I’ll just highlight this: Hulk VS stronger, meaner, intelligent Hulk. Wouldn’t you want to see that happen? Despite her lackluster introduction to the MCU, Black Widow has become a great Marvel character thanks to strong character development in The Avengers and Captain America: The Winter Soldier. I’ve always supported her getting her own movie – Scarlett Johansson has the star power to be the central character of a film. 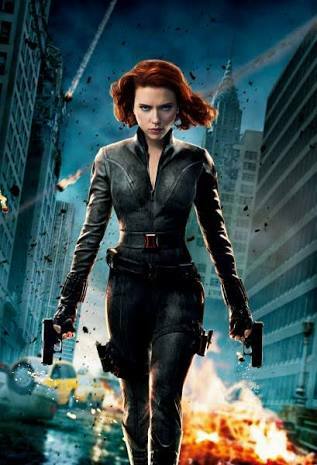 But it wasn’t until Avengers: Age of Ultron that I was fully convinced that a Black Widow film needs to happen. Black Widow is a unique superhero in the MCU because unlike the rest of the Marvel protagonists, she was a bad guy. And we’re not talking Scarlet Witch/Quicksilver levels wherein they were only bad for a short period – Black Widow is “red on your ledger” bad. She didn’t even try lifting Mjolnir because she knew she was far from being worthy enough. Personally, I’m really interested about her past. How did she end up being what she is? In the source material, she’s a product of the Soviet Union’s Red Room program, trained to become a Soviet spy. I’d like a film that would show us how she transitioned from this to becoming one of S.H.I.E.L.D.’S top operatives. I’ve read some of Kevin Feige’s interviews regarding a Black Widow film though, where he mentioned that they’re more interested in Widow’s present. That doesn’t mean that a solo Black Widow film can’t be made, of course. If not a trip to her past, her solo film can be about the price of her defection. I mean, the Soviets wouldn’t let her switch sides just like that, right? It’s logical for her former leaders to want some retribution, and one way to do that is to send another Red Room product after her: the second Black Widow, Yelena Belova. Yelena Belova, the second Black Widow. A solo Black Widow film can take her in a lot of different directions, and can further develop an already complex character. And even if it doesn’t, at least we’re going to see more of Scarlett Johansson. And there you have it, three films that I think would be worthy additions to the Marvel Cinematic Universe. What did you think about my ideas? Have you thought of other MCU film concepts? Tell us what you think by leaving your comments below.